” socio-economically diverse.” for many reasons, parental education has generally been a better proxy for social class than income. that said, you are right that the line, if one isn’t attentive and well-versed in that literature, could be misleading. Rory: Agreed. If Williams were just using the college degree data (socio-ec tag 1 in Admissions Office speak) to claim that it was more socio-economically diverse today than a decade ago, that would be fine and correct. But Lenhart is doing more than that. He is claiming that the increase in socio-economic diversity has caused an increase in financial aid spending. If that is true, then it must be the case that average/median/20th-percentile/whatever family income has gone down. Them ignoramuses without college in their family backgrounds don’t deserve no (and would be a waste of) financial aid. If anything, an increase in financial aid spending causes the increase in socio-economic diversity. But it is true that we are well known for great financial aid to middle and lower income families, which means we probably attract a lot more from these groups than we used to. 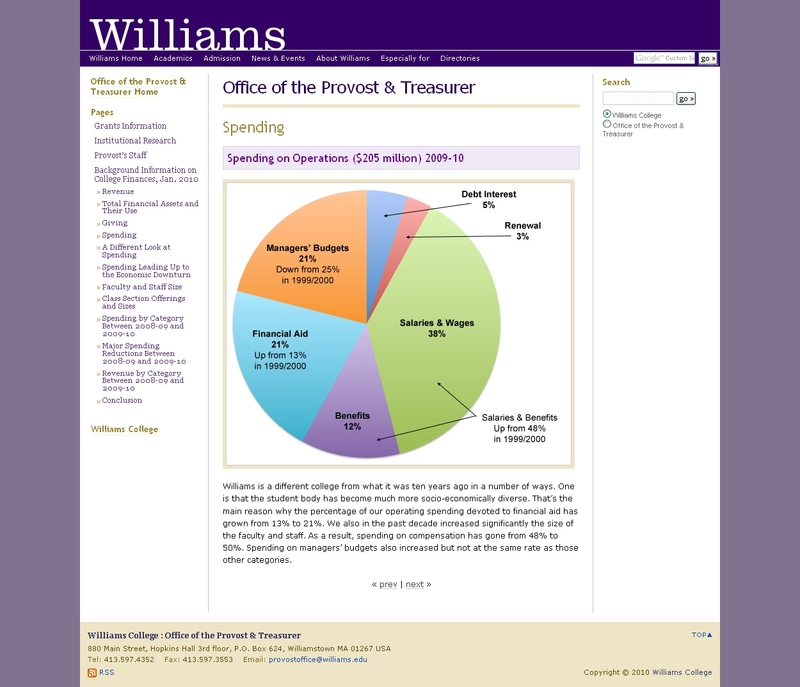 What percentage of Williams students are on Pell Grants, and what was the percentage 10 and 20 years ago? Morgan: I don’t have any good data on Pell Grants decades ago. You can, however, check out College Insight for data recent data. Here is what it show for Williams. And that is impressive! I had no idea that the number of Pell Grant recipients had gone up by 50% less then a decade. Have their been any changes in eligibility? If not, this would be the first real evidence that I have seen of increasing economic diversity at Williams. Questbridge may have play a roll in this change. Hasn’t Pell Grant qualification changed in that period? Very minorly. In most cases, one still has to have a family income below around $40k. EphBlog is powered by WordPress and delivered to you in 0.884 seconds using 34 queries..